Traditional storage management can be complex and confusing, with the configurations involved being overwhelming. Scaling and replication can often be time consuming and frustrating, if not practically impossible. The time and complexity required can drive small and medium businesses to engage expert consultants just to manage their data storage solution and optimize it for their application requests. Small and medium organizations have more on their plate to manage than just storage. 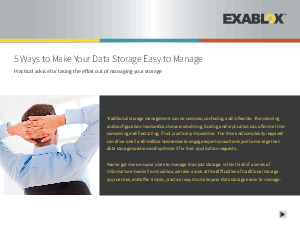 This e-book from Exablox explores challenges of legacy storage approaches and offer five (5) simple, practical ways to simplify data storage management.